Hi there friends and future friends! Cheer Up! has been so crazy this week, hasn't it? I've seen around the interwebs that a lot of people are sharing my feelings of mixed emotions when it comes down to the love triangle that's beginning to form in Cheer Up! As you know I predicted it several episodes back and now that it's come into fruition, the feelings are even more intense than I expected. We see it come even further into fruition this week. Let's talk about that and what else has been going down at Sevit High since we last visited. I'm going to throw out a disclaimer that we've got a lot to talk about this week. When we last left off, the cheer team had just used their cheer to cheer up their favorite homeroom teacher, Teacher Yang by writing on their signs that he was innocent and should be allowed to come back. Afterward, the principal is nervously meeting with one of the big wigs from the education office. He seems to find the students amusing; the principal clearly does not. Meanwhile, the cheer team is celebrating with their teacher and coach. Not only are they on a performance high, but they're also proud of the fact that they stuck up for their teacher. And he's proud of them; he's moved almost to tears by how they put themselves in danger academically for him. Things get even more powerful emotionally in this scene when Jae Young and her friend from Baek Ho apologize to Teacher Yang for lying. It is the most sincere apology from a former bad girl that I've ever heard. You can tell that she really means it and feels genuinely bad. Jae Young expects Soo Ah to apologize as well, but instead she says she has nothing to say. Jae Young is ready to go after Soo Ah when Yeon Doo tells her it's not worth ruining the mood. Look how the tables have turned here, she's becoming the feareless leader of the members of Baek Ho now over Soo Ah. You can tell these girls have started to look up to and respect Yeon Doo. Soo Ah doesn't want to ruin her reputation as the perpetual sourpuss at the party and points out how they can celebrate all they want, but it's not over. And they're not going to win in the long run. Shortly after, the principal comes in and calls Yeon Doo and the girls from Baek Ho (besides Soo Ah) out of the classroom. The girls are nervous, but Yeon Doo takes Jae Young's hand and reassures them while they're walking. She instructs them to tell the principal that she made them do it. 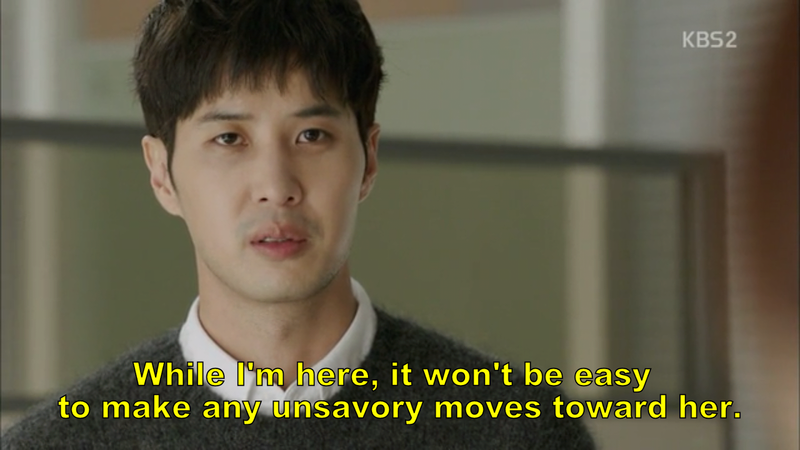 It's such a sweet gesture and so classic Yeon Doo- worrying about everyone else first. Back in the classroom where the rest of the cheer team remains, the mood is suddenly darkened. The students and especially Teacher Yang and Coach Nam are worried about the girl. the weight of the fact that they are going to get in trouble for doing something good falls on them on. It takes Ha Joon only a matter of seconds before he decides that he needs to take action and bolts out of the classroom. He catches up with the girls and the principal and runs to step in front of them. The fact that Ha Joon is the first one to take action for Yeon Doo hits me right in the heart and it may just be me, but as Ha Joon is leaving the room it seems that Yeol is a bit put off by the fact that it was Ha Joon who was the first one to take action and not him. Ha Joon tells the principal that he was also in on the cue cards that declared Teacher Yang's innocence and that if that's why she was taking Yeon Doo away, then she should take him too. Both Yeon Doo and the principal are quite shocked by this. And just as I'm about to get disappointed that the rest of the cheer team just stayed in the room while Yeon Doo was getting in trouble, everyone with the exception of Soo Ah (of course!) shows up as well- declaring they were all in on it. Yeol tells the principal she'll have to expel them all and muses about how that will look. From the expression on the principal's face, she knows she has no choice and so she leaves. Yeol and Ha Joon are back in their room and Ha Joon is looking fondly at the bandage and antibiotic cream that Yeon Doo had given him. He smiles thinking about her and the events of the day. 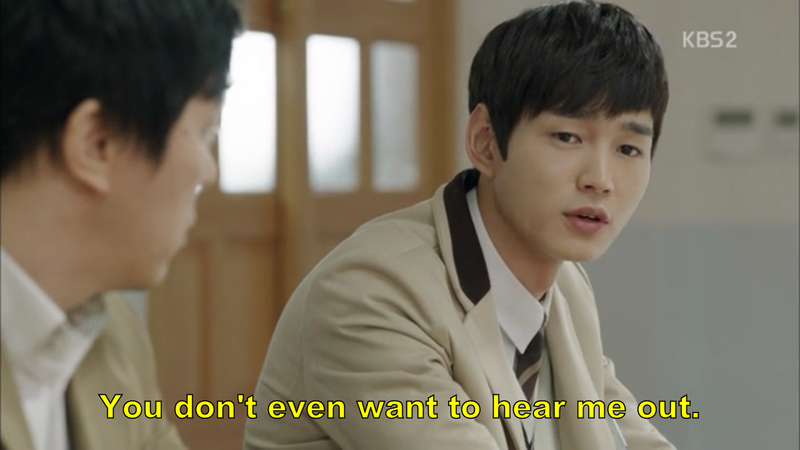 Yeol puts on a laid back demeanor and mentions to Ha Joon how his actions were unlike Ha Joon and asks why he did it. Ha Joon responds that it's hard not to do anything when Yeon Doo so quickly stands up for justice. I find this amusing, because Yeol is trying to act like he doesn't care, but he clearly does. He suspects that Ha Joon has started to develop feelings for Yeon Doo and Ha Joon doesn't want to come right out and say it since he knows that Yeol feels the same way about it. I am worried about their friendship. It's clear that they've been very close for a very long time and it would be awful to see that relationship broken over a girl. But I think considering their brotherly love for one another, if it ever came down to Yeon Doo having to choose between them, that the other would be understanding and not let their friendship be destroyed. Other friendships may dissolve over a girl, but I have more faith in these two. The Education Office has reopened Teacher Yang's case and brings in the Baek Ho girls to get more facts on the matter. Jae Young and her friend admit to lying saying that they didn't mean to outright lie, but had a misunderstanding that snowballed. Soo Ah, however, remains firm that her story is not changing at all. I'm so proud of these two girls that admit to lying. It's a hard thing to do, especially when it gets to such a serious level. Not to mention Jae Young's own mother told her to continue the lie. It seems like telling the truth is such an obvious thing, but unfortunately that's not the way the world works. Props to the writers for such a great piece of character development here. And thanks to the girls' honesty, the Education Office is declared not guilty. The princpal meets with Teacher Yang and congratulates him on getting his name cleared, but reminds him that he's still a contract worker and his contract is going to expire that year. Teacher Yang turns it around and reminds her he will still be there for the rest of the year and tells her that she won't be able to do anything unsavory toward Yeon Doo or transfer her out while he's there. Ahh, how sweet! He's protecting Yeon Doo as she protected him. He didn't stick up for her more strongly before because he was worried about the security of his position and his sick mother who he has hospital bills to pay for. I think he feels badly about that and is determined to do anything in his power to protect every one of these kids, but mostly Yeon Doo who is always sticking out her neck for others. When Teacher Yang comes out of the principals office Yeon Doo, Yeol, and Ha Joon are waiting for him. They go to the roof and have a Jjajjangmyun (black bean noodles) picnic, even though take out is against the rules to celebrate his reinstatement. They ask him if he's okay and he responds somewhat beautifully in saying there's no such thing as being okay, and everyone is always just lying and saying they are. They agree and have a pleasant meal together. Now that the athletic competition is over, the students have mid-terms to worry about. Competition is cut-throat and Yeon Doo wonders why the students don't use Yeol's notes to study since he's always number one. 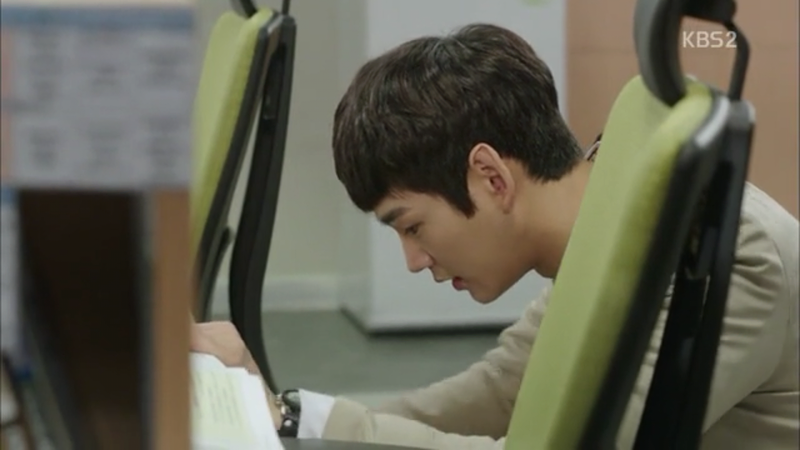 He seems to have the same idea as he brings Yeon Doo his notes and offers to help her study. She gladly takes him up on his offer and he helps her study after hours in the laundry room. He's surprised to see that she actually cares about her grades and asks her why she came to Sevit when she knew it would be hard. She tells him that it was her mom's wish and therefore she's doing it for her mom's sake. Even though they don't even have cheer practice, all of the cheer team members find themselves in the practice room studying together. Even- wait for it - Soo Ah. The members of Baek Ho are helping the members of Real King and it's a really touching scene actually because it says so much about how their relationships have progressed so far since the start of the drama. At first avoided each other, but here they are seeking out each others' company. 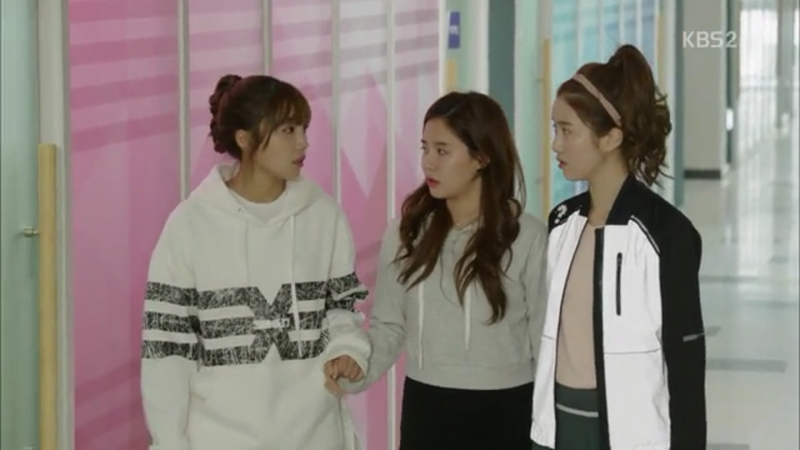 While Soo Ah did choose to study in the cheer room, it seems as though it wasn't a good choice for her as the other cheer team members' talking drives her batty. The other girls point out that she needs to chill, that even Yeol is chill and he always gets number one. Soo Ah leaves in a huff and starts to have a nose bleed from the stress right after she leaves the classroom. Teacher Yang sees her and hurries over with his handkerchief. She makes sure to point out that she doesn't feel badly about what she did at all. He ignores this and tells her he knows that she's having a hard time and to come see him whenever she needs to. Wow! Even though it's no secret that I hate Soo Ah, I want to hug Teacher Yang for looking out for her. That's what a good teacher does- takes care of even the kids that are so easy to hate. Yeol and Yeon Doo are studying again when she falls asleep. Yeol sets up a barricade of notebooks to keep the sun out of her face and leaves a post-it note on her forehead asking if she wants to see a movie with him after mid-term. Later, while they're in class he gets anxious for a response and so he texts her and motions to her to check her phone. After attempting to resist, she goes to check her phone when Teacher Yang catches her and tells her he's confiscating her phone until after mid-terms. Yeon Doo begs him to reconsider because as she told Yeol her phone charm, a little bear, is her lucky charm and she can't take tests without it. Yeol feels guilty about getting Yeon Doo's phone confiscated so he sneaks into the teacher's office and grabs the phone charm off of it, but while he's in there a teacher comes in. He attempts to hide behind the wormy teacher's desk, but the other teacher spots him and tells him to get out. Yeon Doo and Yeol are in the school convenience store and she's whining about how she needs her phone charm. Yeol now has the charm, but doesn't yet reveal it. Yeon Doo's friend from Real King comes in and gives the two crap about dating and films them on his phone, asking what they're doing hanging around together so much. Then it's off to the next class, which is taught by Mr. Wormy. Soo Ah gets upset because Yeol gets a better essay score than her. She questions wormy who tells her that her essay was great, but Yeol's was amazing. Their conversation is interrupted by two students that Wormy has to chase down the hall. As he does this, the contents of his bag spill on the floor, including a USB drive. Soo Ah looks around to make sure that no one is watching and then takes the drive. She plugs it into her computer and sees that it has the midterm test questions on it to she downloads them and then throws away the drive in the bathroom garbage. When wormy realizes that the drive has gone missing, he's frantic. Soo Ah overhears one of the teachers tell Wormy that Yeol was in the teacher's office and she sees her chance. Soo Ah goes back to get the drive and then slips it into Yeol's bag when he's not looking. Wormy comes in, furious and accusing Yeol of stealing it. When Yeol denies, it Wormy grabs his bag and shakes out the contents to find the USB drive. I'm going to remain calm while talking about Soo Ah at this moment although it's difficult. I mean...just...I mean...AHHHHH!!!! She's evil incarnate. I frickin' hate her and that's really all I can say. Okay, so so much for remaining calm. Moving on, rumors start to go around the school that Yeol has maintained his position as number one for so long because he's been stealing the answers. Even the cheer team questions whether this could be true, but Ha Joon and Yeon Doo don't like them talking about Yeol this way. As Ha Joon is about to go off, Yeon Doo beats him to it. She chastises her friends for not believing in Yeol when they know his character and the fact that he would NEVER do something like that. Yeol is called to the principal's office as well as his father. Who for confirmation for all those that doubted, IS Yeon Doo's mom's boyfriend. The principal says that with the evidence they have, Yeol will have to be expelled. His dad barters with the principal to get Yeol off with community service instead. In either case it means that Yeol is going to miss the mid-term exams. Yeol is annoyed that no one took the time to listen to him or believe him including his own dad. As Yeol's getting ready to leave school temporarily he comforts Ha Joon first and then finds Yeon Doo waiting for him outside the building. He gives her her phone charm. She feels awful when she realizes that he got suspended because of her, but he comforts her as well. When Yeol gets him he expresses displeasure in the fact that even his own father didn't believe him, but his dad says there was nothing else he could do because they had evidence. Yeol agrees that it the logical decision. Meaning, from an emotional standpoint it was still painful. We see a flashback to Yeol as a kid listening to his parents from another room and then we hear the sound of someone getting hit. Followed by him laying on a couch, waiting. He waited for two days for one of his parents to show up before someone finally did. And that was the day he stopped trusting adults. It makes sense now all the times he says "don't trust adults". The adults the most in the world, his parents, abandoned him. So if even his parents would do that, wouldn't other adults be even worse? 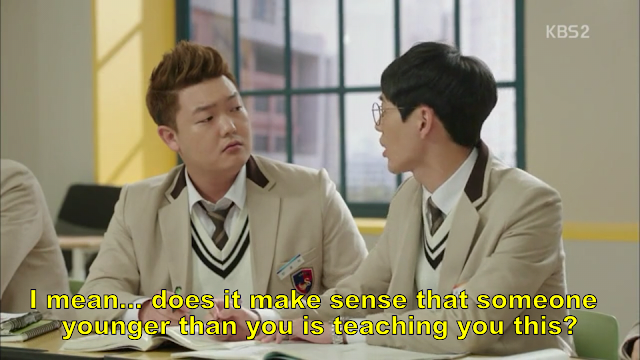 I think that's why he's been a little hesitant to help Teacher Yang and only does so after Yeon Doo initiates it. I wouldn't be surprised if we see a change in heart in that respect down the road. The truth about Yeol's dad, however, that he reveals to Yeon Doo's mom is that he does believe Yeol. That he was only doing the best he could to keep him from getting into even more trouble. Yeon Doo is sad watching Yeol's empty seat during the exam and is worried because he hasn't texted or called to say how he is. We see Yeol performing community service at some sort of retirement home. He's inside sweeping, when the sound of singing comes from outside. His face lights up when he recognzies the voice as Yeon Doo's. He goes outside to see her singing with the seniors and they both shoot enormous smiles at one another. They take a walk and Yeon Doo tells him she thought he'd use his famous intellect to prove himself innocent and come back already. He makes mention of the fact that everyone at the school is happy to have him gone, because it means they'll all move up a place. She says that they can believe in him just as the number one student, but that she believe in him just as he is, without the title. *Sighs* How beautiful. I think she's developing some strong feelings for him whether she realizes it or not. Granted, Yeon Doo has a lot of concern for everyone, but there's something special about the way she smiles at him. Later that night, Yeon Doo is sneaking around the teacher's office to try to find the CCTV footage to clear Yeol's name when she literally bumps into Ha Joon who is doing the same thing. The next day couple of days, the two pour over the footage together, looking for something to clear Yeol's name. To no one's surprise, Soo Ah claimed Yeol's number one position when the results of the mid-terms come out. To reward her, Soo Ah's mother buys her a very expensive purse that she's anxious to show off to her roommates (the other girls from Baek Ho). 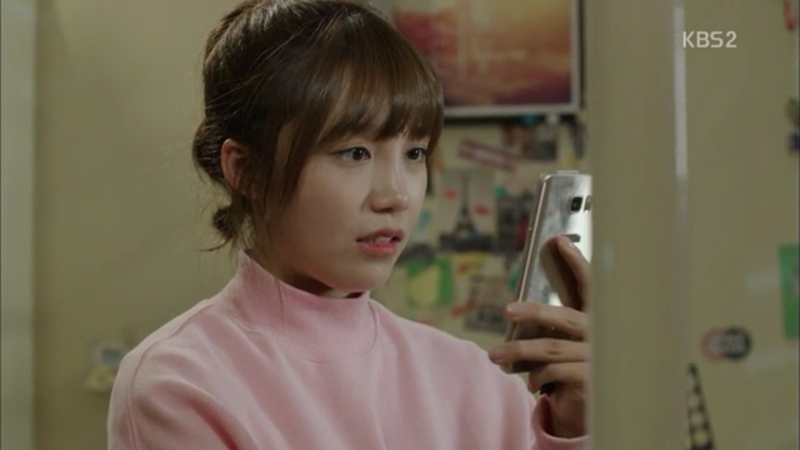 They quickly admire it, but then remark on how Yeon Doo is trying to find the CCTV footage claiming Yeol's innocence and Soo Ah panics, knowing that there is most likely footage out there of her taking Wormy Teacher's usb drive. Shortly, Yeon Doo comes into the room on the phone with Ha Joon, talking about trying to find the footage. After she hangs up with him, she gets a text from her friend from Real King. It's a clip of her and Yeol in the convenience store and she gasps and announces that she's just found something that will clear Yeol's name. And that's where our episode ends. How are you guys feeling? I don't know about you but my heart feels very plausibly like it could rip in two. Can't wait to see how things turn out after the next episode. If you haven't caught up with Cheer Up! you can watch the episodes on DramaFever or Viki if you're in the U.S. or you can catch my recaps episodes by clicking on the drama's page below! Fighting!